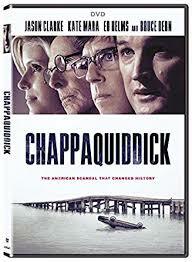 Chappaquiddick is a first-rate dramatization of the events surrounding the July 1969 drowning death of Robert F. Kennedy campaign aide Mary Jo Kopechne (Kate Mara, Happythankyoumoreplease) after in a car driven by Ted Kennedy (Jason Clarke, Zero Dark Thirty) that goes off a bridge and into a pond. Expertly directed by John Curran (The Painted Veil, Stone), Chappaquiddick delves into other topics than the key tragic incident, which is hauntedly recreated. The film also successfully tackles the politics of spin, as advisors try to save Kennedy’s questionable future as a public servant; Ted’s rocky relationship with father Joe Kennedy (Bruce Dern, Nebraska), the stern, infirmed family patriarch; the affect the loss of assassinated brothers John and Robert had on Ted; and Kopechne’s mother and father’s reaction to their daughter’s untimely demise. Curran is particularly good at evoking the era, with the moon landing occurring the same week as the accident providing historical context. He films the swirl of events in an unobtrusive manner, with even-handedness and a notable lack of sensationalism. Questions about Kennedy’s drinking and romantic involvement with Kopechne are kept on the backburner. Of course, Curran is helped by formidable acting turns all around led by the chameleon-like Australian thespian Clarke’s impressive work, balancing both Kennedy’s pathos and charisma. Mara is effective as his doomed rider, while funnymen Ed Helms (Love the Coopers) as Kennedy cousin Joseph Gargan and Jim Gaffigan (Chuck) as former state attorney Paul Markham score in serious, important supporting parts. And although he is only in a few scenes, Dern’s wheelchair-bound Joe Kennedy is downright frightening as the clan’s Svengali who, even in his infirmed state, uses his powers behind the scenes to save the family name. Quiet, methodical and intense, Chappaquiddick did decent business, bringing in $18 million at the box-office, and drawing a Baby Boomer-aged crowd and beyond familiar with the incident, the film’s symbolic title and the Kennedy legacy. The film, which straddles the line between indie effort and Hollywood production, is poised to expand its audience thanks to word-of-mouth, intense interest in contemporary politics and favorable reviews.